In Jon Favreau's The Jungle Book, Disney's live action remake of their own Rudyard Kipling-inspired movie, Shere Khan is many things. Our antagonist, immaculately rendered with exquisite CGI, is sinister, Machiavellian, ruthless and ferocious. Perhaps most fascinating of all, and rather beautifully from a thematic and narrative stance, the fearsome tiger is also right. We are introduced to Khan, a splendidly iconic villain, as he prowls through the animal kingdom, growling his visceral intention to destroy the man-cub (Mowgli, Neel Sethi) hosted by the wolves of the jungle and reared as their own. Khan (Idris Elba) fears that it is within the human's nature to wreak havoc with the tools he creates - Mowgli, he prophesises, will destroy the animals' habitats and supplant the natural order with murder-by-fire. He's had experience of Mowgli's kind before and speaks with great foresight. When we consider all the species which homo sapiens have driven to extinction and endangerment with our inventions, we find ourselves in the peculiar position of having to admit maybe the malefactor here has a genuine point. Whether it is devastating the ocean floor with our waste or wiping out dodos with avaricious neglect, our kind have a history of decimating the planet we share. Are we human beings ruinous by our very nature? What else is Khan doing but fighting for his own survival against a force more powerful than his own? Is he powerless in the face of his own predictions? For anyone au fait with the 1967 version of The Jungle Book, or even Stanley Kubrick's Space Odyssey, Khan's warnings of the unfettered power of technology which man yields and wields will ring true. The tools we cultivate can often, intentionally or otherwise, rain great destruction yet, as demonstrated here by the stunningly handsome computer animation provided by WETA, we humans can also utilise them for things of beauty. 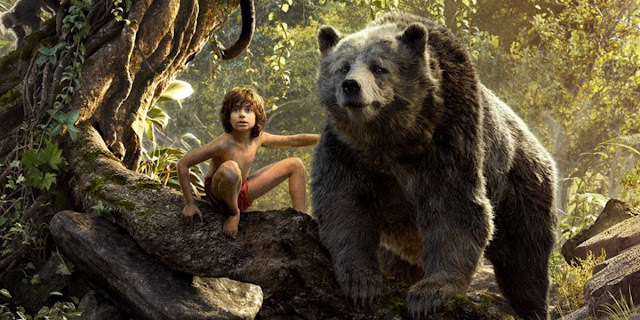 As Mowgli uses his "tricks" to acquire honey, capture water and, even, save animals from perilous situations, we see the positives in our inventions and ingenuity. It is up to us, it seems, as to whether we should use our innovations for good or for evil. This feature, a magnificent production of great insight and splendour, fits neatly into the former category. The story, too, rather than focusing entirely on Khan's damning theorem, also provides family-friendly delights for audiences of all ages - something which will surprise few who have also seen Favreau's delightful Elf. This is a thrilling adventure movie full of memorable set-pieces and, particularly in Bill Murray's Baloo, a warm, beating heart. We're invited to laugh along with Mowgli and Baloo as they loll around in lazy rivers - through laughter our empathy grows, making the tense moments even more captivating. We find ourselves on the edge of our seats as King Louis (Christopher Walken, channeling the character as a mafioso racketeer) captures our heroes or when Kaa (a seductively husky Scarlett Johansson) teases squeezing the life out of them. This is a rare feature in which we're asked to think and feel with equal abandon. Were I to highlight one gripe with the film, however, it would be impossible to ignore the conclusion - this is a coming-of-age tale in which our hero fails to come of age (symbolically speaking). Whilst it may be comforting for young audiences to wish to never grow up, the cop-out ending here shows a degree of cowardice not really found elsewhere in this otherwise daring movie. 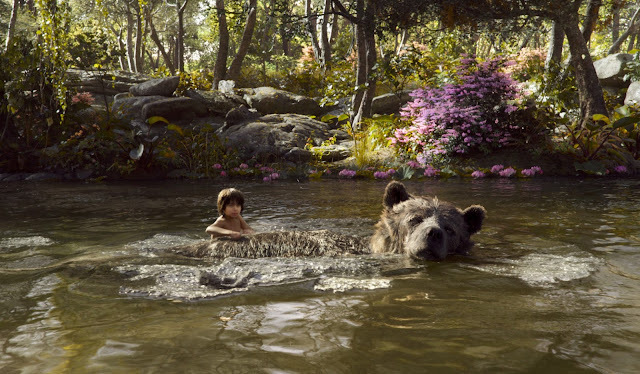 The Jungle Book brings us close to the natural world, the sublime beauty and ugly violence found within, and asks us to consider our place alongside it. This is the movie which many people who observed The Revenant convinced themselves and swore they saw. How wonderful it is that a semi-animated tale with a singing bear and a Christopher Walken-performed show-tune can bring us more philosophical truths and technical innovations than the movie this year's Oscars tried to sell us on.